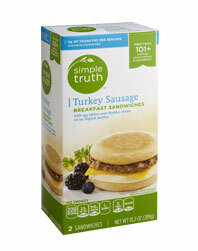 Last week I tried a new Breakfast Sandwich that I found at Kroger, Simple Truth Turkey Sausage Breakfast Sandwiches. I’ve found a winner for Breakfast Sandwiches here! I’ve tried countless frozen Breakfast Sandwiches, without much success of finding a good one until now. They can be found in the Frozen Organic Section of Kroger. They come 2 to a box and contain 220 calories and 23 carbs (20 net carbs) per sandwich, not too bad at all for a Breakfast Sandwich. It’s a Turkey Sausage Breakfast Sandwich with Egg Whites and Cheddar Cheese on an English Muffin. All the ingredients are of nice size portions. To prepare it just remove on of the Breakfast Sandwiches from the box and remove the plastic wrapping. Wrap the Sandwich loosely in a paper towel and place it on a microwave usable plate. Then heat on high for 1 minute and 45 seconds, the time varies according to the microwave. I have to mine for 2 minutes. The Sandwich comes out perfect! The English Muffin remains soft, and not hard like a lot of Breakfast Sandwiches. The Turkey Sausage, Egg White, and Cheddar Cheese Slice combine to make one delicious way to start your day. Easily prepared and no mess to clean up! If you get a chance give these a try, I love them!